Christmas is not my favorite holiday. I enjoy the spirit and the meaning of the season. I am all in favor of celebrating the birth of Christ and I am not all that opposed to a fat man sliding down my chimney to steal my milk and cookies. However, the stress of gifts, gift giving and parties is too much for me to handle. No matter how much my wife and I try to keep a lid on things, we over-extend ourselves financially every year around Christmas. That is why I like Thanksgiving so much. Mrs. Stew and I are opposites. She loves parties and would have people over or go to someone else’s house nearly every night of the week. Me? I like to have a little space. I am all for hospitality and friendship and all that, but in measured doses. The result is that we complement each other, she keeps me from becoming a complete agoraphobic hermit and I let her know that it is okay to stay home once in a while. And then there is the gifts. I don’t have enough money to contribute to our retirement fund, but the list of people to whom I am obligated to purchase a gift just keeps growing and growing . . . and growing. I try not to be a Scrooge and there are people to whom I really want to give a gift. I am willing to sacrificially give to my kids, my wife, most of my extended family, Mrs. Stew’s parents, sister, brother-in-law, and my grandparents. I would give to those people whether or not they had any ability to reciprocate. I definitely want to express my appreciation to them or hopefully give them a gift that they will value. The problem comes when I start to consider employees, employers, supervisors, neighbors, acquaintances, the mailman, the trash collectors, etc. Everytime I turn around, I am being asked to contribute $5 or $10 so we can go together for a gift for someone else or to bring a “gift worth $15” for a gift exchange or so-and-so is expecting a tip. These gifts are putting us in the poorhouse . . . well, we were already there . . . these gifts are putting us under the poorhouse. Here are a few solutions that may or may not work for you. Homemade gifts: not sure what I can make that anyone will actually appreciate. My wife definitely tries to do this with some success, but this strategy is limited. Budget and save up during the year: Very good idea, but we do not have any more room in our budget for another item. We have a negative savings rate as it is. Our finances are heading in the right direction and we are keeping our heads above water, but we just finished a year with an extra $14,000 of expenses due to our house not selling. Graciously decline: Not sure if there is a way to do this without offending or appearing cheap or worse – everyone gives me a gift anyway and feels sorry for me. Yikes! These ideas have not all worked for us as you have probably gathered. :) Furthermore, while I am thankful for the gifts given to me – really, I do appreciate the thought – but the fact is that they rarely help with the electric bill or the food portion of our budget. We just swallow hard, bite the bullet, git ‘er done and reap the consequences in January. We have done better this year, Mrs. Stew has come up with frugal solutions to many of our gift giving responsibilities and at least our house sold in July. I have much to be thankful for, God continues to meet our needs. I am looking forward to next Thanksgiving, though, no gifts to give, no gifts to awkwardly recieve and the meal is better. Gasp! Not enough to contribute to savings but you’re feeling pressured to buy junk for everyone in sight? Time to sit down with the family for a frank conversation. If you’re feeling that way, there’s a good chance others are, too. They might be open to the idea of reducing spending on holiday gifts. 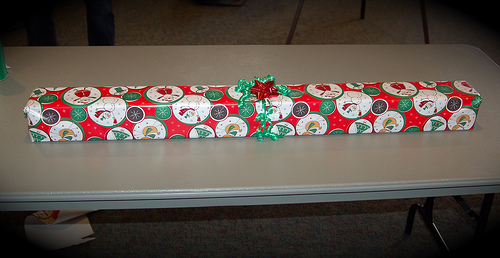 Some families limit gift-giving to small children. And some people substitute some meaningful activity — a family party or a big communal outing, for example — for the gifting frenzy. You’re not required to give money to everyone in sight. Just quietly “forget” to donate. I don’t carry cash, so when someone comes to me with their hand out, I can honestly smile and say I don’t have any money on me but I’ll bring a check. Then I forget the check. Interestingly, when you do give those kinds of folks a check, they often don’t cash it! The mailman and the trash collectors are not going to stop delivering mail and picking up the garbage if they don’t get a year-end bonus from you. Chances are they earn more than you, and as government employees, they’re getting a retirement plan that evidently beats yours hands-down. It’s unethical for an employer or supervisor to expect to get gifts from the slaves…what on earth does THAT say? Neighbors and coworkers can expect to get a plate of homemade cookies wrapped in cellophane and a red ribbon, and that’s about it. Thank you very much. As for the office gift exchange? Contrive to be sick on that day. Or just quietly, without saying anything, don’t contribute…I’ve never contributed to one of those things. The only consequence is that the people who don’t contribute don’t get to draw a gift. Sob! Totally agree with “Funny.” Also, if you shop with cash, and the cash runs out, you’re done Christmas shopping. No going over the budget that way. We fill our kids stocking from the big guy, and each kid gets one present (approximately $20 each, although this year they were $15, $15, and free) from mom and dad, and they are totally satisfied with this. If things are so tight, you and your wife can agree to not buy for each other, and try to get the family to babysit one night while you’re visiting. You may enjoy that more than another thing anyway. We are like you and Mrs. Stew … I am the social butterfly and my husband is not. And we have changed our giving this year too: limited cash gifts to $25 or less and included more ‘homemade’ gifts (cookies, pictures my daughter painted). I have never tipped the garbage man or postal worker (should I?). When I am out of debt (in 2 yrs) I will be able to ‘give like no one else’. I think you might be pleasantly surprised if you suggest dropping gifts for most adults. We tell our friends, spending time with them is enough for us. They are happy as well not to shop, wrap, etc! Each year we drop more gift buying that way. Or if you have a large circle of friends, each draw a name. White Elephant exchanges can be fun as well. Now I just need a cut off age for neices and nephews! I guess I have some sympathy for poor college students versus someone on their own working (although the age can be the same). Neighbors and acquaintances? You don’t even call them friends, why would you get a gift for these people. It’s time to say no. Who cares if you look cheap, like you said they don’t pay your bills. If these people are your friends they’ll understand, and if they’re not why do you care what they think. As far as pitching in gifts for employers, supervisors, and employees just say you’re not going to this year, and don’t sign the card. Make it known that you won’t and so you don’t expect anything this year. If they still choose to give you a gift then accept it and say thank you. Just remember it’s their choice and you gave them fair warning that you won’t be exchanging gifts with them. If that’s how they choose to spend their money it’s their choice. Have you considered getting all the family members together and each person drawing a name of a person to buy a present for out of a hat. It would definitely result in less money being spent on gifts, so your budget doesn’t suffer. Or how about your present being getting together for a potluck meal and watching a movie or playing card games? Why does Christmas have to be a big, expensive production? Another option is to go to your bank and set up a Christmas Savings Account. Decide on an amount, even if it’s only $5.00, to deposit each month or whatever. I used to do this with the property tax on our car when we had a new car and could not afford to come up with $300 or something on short notice.